Handstand workshop + Le Bon -double shot. Health is all about balance. particularly at a handstand workshop. START: Inverted World, Studio Sonic, Reichenberger Str. 124, 10999 Berlin. FINISH: Le Bon, Boppstraße 1, 10967 Berlin. U / S - BAHN: Schönleinstraße. THE WORKOUT: Saturday 11.45am Handstand workshop (level 1 + 2) with Sara. If you’ve always wanted to nail that elusive handstand then this is your chance. This class is a great way to build up your confidence to practice handstands without being afraid and practicing with a partner. But if you think you’ll be mostly taking it easy and kicking up to lean against a wall you are in for a shock. Sara will take you through a variety of pre-exercises and drills to warm-up, build strength and engage all deeper muscles required for the handstand. The key is to sustain your own weight on your hands and understanding how to find the handstand ‘line’. After warming-up, Sara takes everyone through some very useful exercises which range from learning how to balance alone, understanding and starting to practice muscular activation when upside down, alongside easy leg movements in handstands that may help you get up and stay up. The class also includes practicing various different ways to enter and exit a handstand and exercises, so don’t just make it up as you go along and kick straight up hoping to balance! Other skills that are often ignored in more general gymnastics or yoga skills classes are covered here, most crucially learning how to become a good spotter and knowing how to bail out of a handstand safely and confidently. Sara walks around the group and assists everyone individually and gives a really nice personal touch. As she very aptly says, “every handstand is different”. All handstand classes are suitable for yogis, dancers, acro-yogis, aerial acrobats and acrobats and other movement directions. If you’re worrying that you aren’t a gymnastics whizz then don’t. You don't need to have any previous knowledge of handstands to enjoy or come to this class. Curiosity and motivation to learn are all you need! Plus Sara is so friendly and can make any exercise easier or more difficult to cater to every level. FYI: The class is in English (German and Spanish are optional). THE FOOD: Berlin brunch lovers obsess over eggs Benedict, and this cozy places has become known for its breakfast comfort food. The usual suspects like avocado toast with rocket and tomatoes appear on the menu (and has a nice limey zesty twist). The Eggs Benedict also comes with a choice of ham, smoked salmon, avocado and a cheeky hit of spicy Tabasco. More interesting dishes on the menu are the ones to go for. We love the avocado, lime, egg open sandwich. 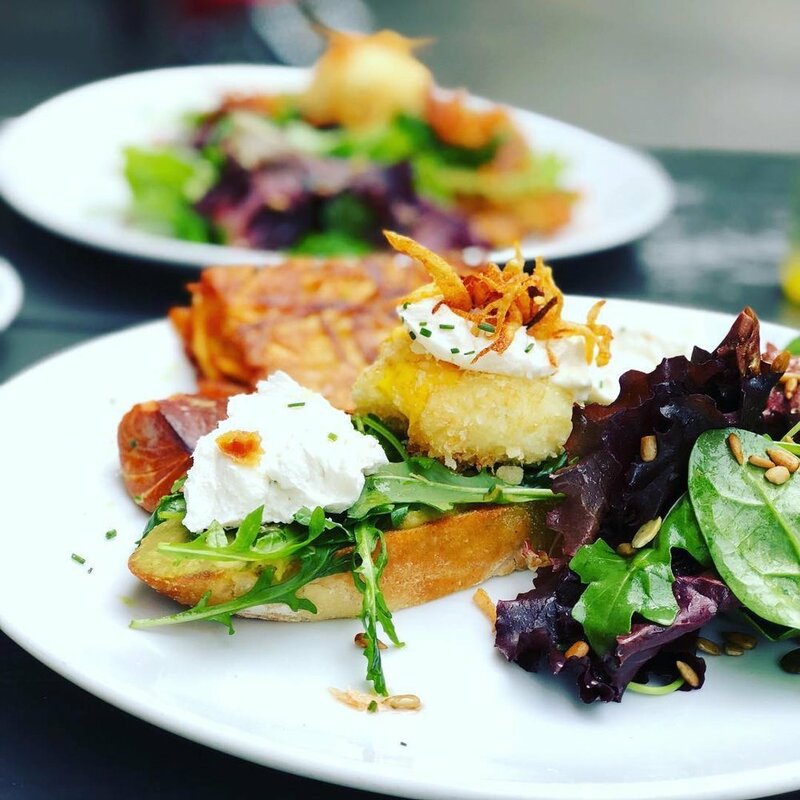 One egg is slowly cooked in its shell, basted in Japanese breadcrumbs and flash fried, served smashed avocado on home-made sourdough toast, topped with either bacon shards or marinated goats cheese. It’s divine. The Croque Monsieur sandwich is a dieters nightmare (but tastes bloody delicious). It features a buttery brioche dipped in orange zested egg whip, filled with a double layer of rich bergkäse cheese, and either ham or roasted tomatoes, all fried altogether with chilli infused maple syrup. Satisfy a sweet tooth with three cranberry pancakes covered with granola crunch and served with caramelized banana, jam, chocolate almond butter, and whipped vanilla cream. Again, for all healthy eaters out there we apologise in advance. If something a bit light is more what you feel like then the cafe also does plain eggs any style, as well as fresh pink grapefruit and a homemade sugar-free nutritious porridge bowl. Brunch at the weekend sans alcool is just a sad late breakfast, but there’s no need to worry about that here. The “Cold Fashioned” cocktail is a potent winner; Cold Brew Coffee, Spiced Rum, Maple Syrup, Cardamom Bitters. Otherwise a fruity Mimosa or Breakfast martini is a little less full-on but still hits the spot. The coffee is also worth a try. The only thing that put us slightly out was the extra sixty cents charged on our bill to upgrade to a plant-based milk. 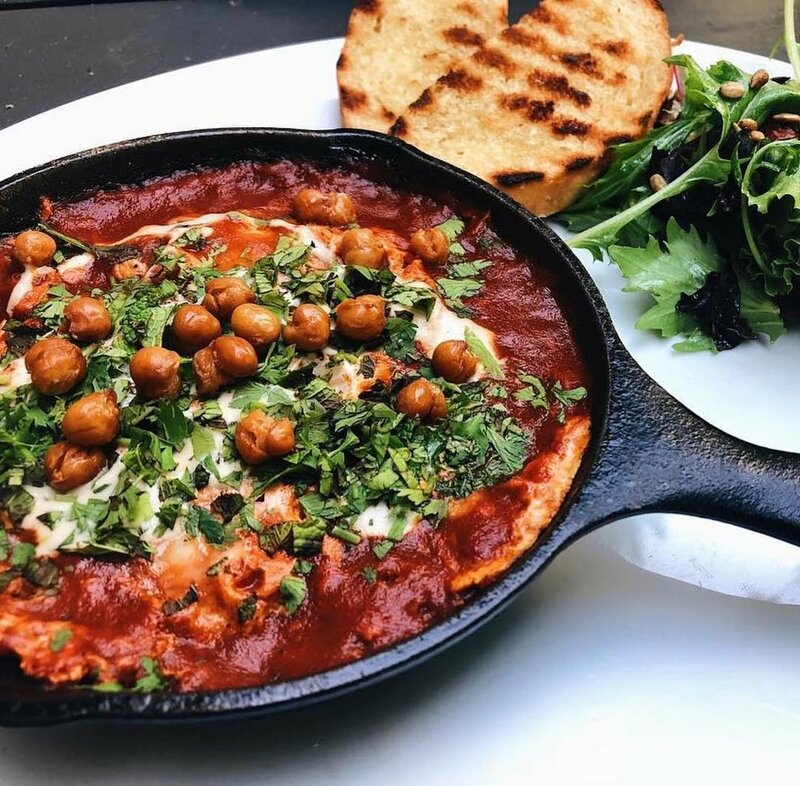 You can’t win them all but Le Bon gets pretty much most of brunch right. THE PRICE: Inverted World: A drop-in class €15, first-timers pay €10. Food: Eggs Benedict with salmon €9.8, avocado €9.2, ham €8.8, slow-cooked avocado Japanese egg €8.8, avocado toast €7.5, Croque Monsieur €9.2, Granola Pancakes €8.2. Drinks: Cocktails €8, Mimosa €5.5. Coffees: Flat white €3.2, Americano €2.2, Latte €3. Oat, Soy milk or extra shot + €0.6. Smoothies €4.8. BEST FOR: Re-balancing the system and finding some new friends who won’t ever let you fall. Sophie Heywood 4 April 2019 Dr. Maury, Schönhauser Allee 62, 10437 Berlin.